This salad is so delicious it can be served on its own, but to make it more of a meal, add in some protein such as cooked chicken, seeds, nuts or cubed cheese. I added cooked chicken left over from the previous day’s roast and it made an extremely tasty supper. I couldn’t get hold of blood oranges so used segments from large navel oranges instead. The dressing was superb and just the right amount to cover all the ingredients. I also learned a new word: The aril is simply the seed pod inside a pomegranate. I’ve always called them seeds. Put all the dressing ingredients into a lidded container and shake to mix well. Put all the chopped salad ingredients into a large bowl together with cooked chicken if using or nuts/cheese. Pour over the dressing and mix well with your hands. Arrange in a serving dish and serve immediately. This salad could easily be made in advance (except the chopped avocado); the dressing kept in a pot and everything combined when ready to eat. Recipe adapted from Food to Glow. 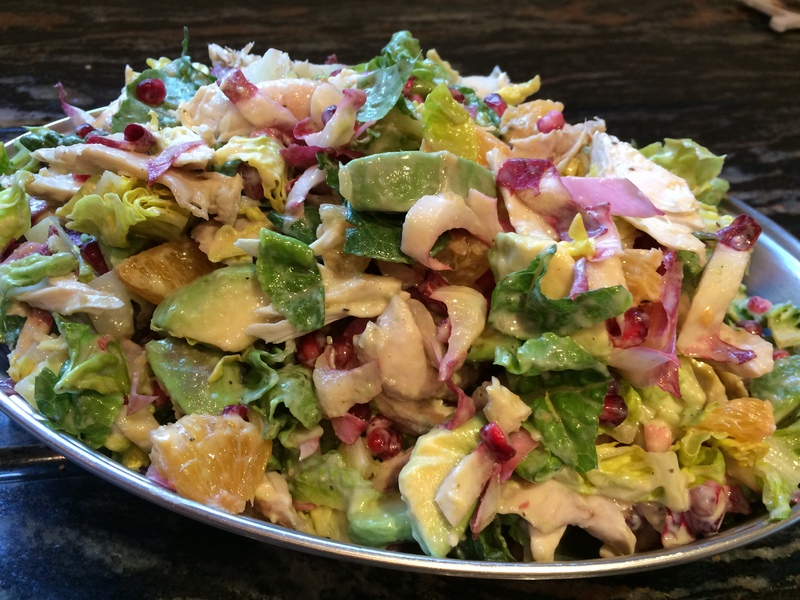 This entry was posted in Dinner, Salads, Vegetarian and tagged Avocado, Chicken, Chicory, Dinner, Gluten Free, Healthy Eating, Lettuce, Lunch, Orange, pomegranate, Poppy Seeds, Salad, Vegetarian. Bookmark the permalink.